Sgt. 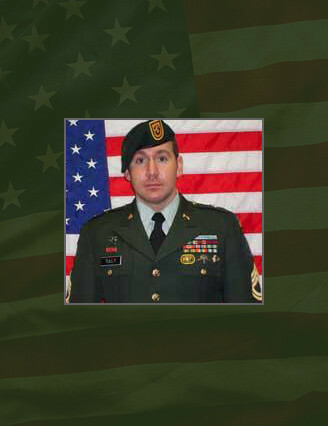 1st Class Michael J. Tully, 33, a Special Forces medic assigned to the Company C, 2 nd Battalion, 1 st Special Forces Group (Airborne) in Fort Lewis, Wash., died Aug. 23 from fatal wounds sustained when his vehicle was struck by an improvised explosive device near Al Aziziyah, southeast of Baghdad, Iraq. Tully was born and raised in Pa. After initially entering military service in the U.S. Marine Corps, he transferred to the U.S. Army in 1997. Tully was assigned as an infantryman in Company E, 313 th Military Intelligence Battalion, 82 nd Airborne Division at Fort Bragg. Tully then served as a Long Range Surveillance Detachment assistant team leader in the same unit one year later. In 2004, he was selected to attend the Special Forces Qualification Course at Fort Bragg to become a Special Forces medic. He earned the coveted “Green Beret” and was assigned to the 1 st SFG(A) at Fort Lewis, Wash., in Dec 2006. Tully’s military education also includes the Warrior Leaders Course, Basic Noncommissioned Officer Course, Basic Airborne Course, Military Free Fall Parachutist Course, Ranger Course, Survival, Evasion, Resistance, Escape Course, Total Army Instructor Training Course, Long Range Surveillance Leaders Course, and Special Forces Diving Supervisors Course. His awards and decorations include the Army Commendation Medal Second Oak Leaf Cluster, Meritorious Unit Citation , Good Conduct Medal Second Award, National Defense Service Medal Second Award, Global War on Terrorism Service Medal, Korean Defense Service Medal, Noncommissioned Officer Professional Development Ribbon, Army Service Ribbon, Overseas Service Ribbon, U.S. Navy and U.S. Marine Corps Overseas Service Ribbon, Expert Infantryman Badge, Parachutist Badge, Military Free Fall Parachutist Badge, Scuba Diver Badge, Ranger Tab and the Special Forces Tab. He was posthumously awarded the Bronze Star, Purple Heart, Meritorious Service Medal, Iraqi Campaign Medal, and the Combat Infantryman Badge. Tully is survived by his wife, Heather of Columbus, Ga., and his son, Slade of North Port, Fla. He is also survived by his father and stepmother, Jack and Marilyn Tully of Falls Creek, Pa.; mother Dolores Newman of Glendale, Ariz.; brother John Tully of Anchorage, Alaska (currently serving in Iraq); and his sister Heather A. Farkas of Northampton, Pa.